Passers of April 17, 2016 Civil Service Exam - Paper and Pencil Test (CSE-PPT) known as the career service exam for Cordillera Administrative Region (CAR) were announced online on Thursday, May 26. 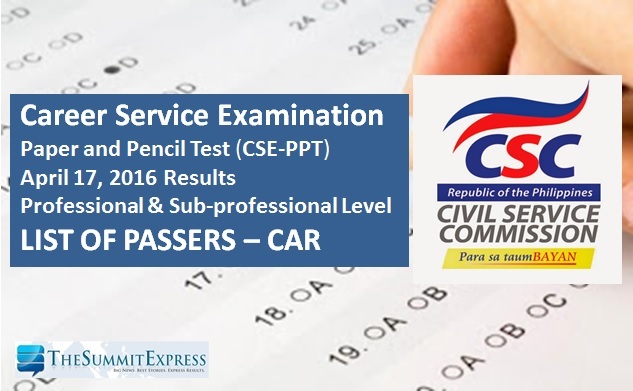 The Civil Service Commission(CSC) said that 1,086 takers in CAR passed the professional level and examinations. Below is the full list of successful examinees for CAR (Abra, Apayao, Benguet, Ifugao, Kalinga) civil service exam (CSE-PPT) professional and sub-professional level.